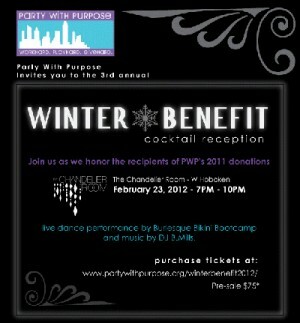 Party With Purpose (PWP) is a volunteer-based not-for-profit founded to make a positive difference in the world by producing unique events to raise money for charitable causes. Over the past eight years, PWP has donated almost $300,000 to help our neighbors in need and had a great time doing it. They have hosted amazing benefits in the past such as “RockJazz for Japan”and “Helping at Home and in Haiti”. There’s nothing like having fun while you help people, after all that’s part of the Skinny Chef Philosophy! I hope you’ll come out to lend your support on February 23rd, 7 to 10pm, at the beautiful Chandelier Room at Zylo’s (located at the W Hotel) in Hoboken, NJ. Get your tickets now!